1. Tim Laycock, Artistic Director of the New Hardy Players, with Furze Swann, who has organised the Going the Rounds for many years, and Alastair Simpson, conductor. 2. Alastair Simpson conducts the massed band and choir from NHP, The Madding Crowd and the Ridgeway Singers at Hardy’s Cottage. 3. The Frome Valley Morris performed their version of St George Mummers’ play, which was featured in The Return of the Native, NHP’s production over the summer. 4. The Madding Crowd have helped to organise the event for many years, and even though it is under new management, they still sent a contingent of fine musicians and singers to swell our ranks. About 80 musicians and singers were joined by 50 audience members, some of whom came from as far afield as Cardiff to join us for this special evening. The performance on Saturday 18 July is our last of this year, so make sure you come along to see us. We have had record audiences at all performances this year, and much praise for the adaptation, the acting and the music. Due to demand we have made changes for tonight’s show at Watercombe House – if you turn up to tonight’s show we will fit you in! By setting the stage in the new amphitheatre (instead of the walled garden) more of you will be able to come along and enjoy. Parking will be in the same place. Don’t forget you can bring a picnic to enjoy before the performance. After an amazingly successful first sell out week of the our production of “The Return of the Native”, the cast said farewell to Toby Ingram, a Thomas Hardye school sixth former who has been playing the part of Clym Yeobright, “The Native” of the story. Ieuan lives in Portesham and went to school at Budmouth College. He graduated at Arts University Bournemouth with a BA Acting in 2014. He has been busy since graduation, creating the role of Bob in AsOne Theatre Production “ Passion” and has just returned from Italy where he toured in productions for Lingue Senza Frontiere. Further information on “The Return of the Native” are on our Current Production page. There is no better way to spend a beautiful summer’s afternoon than to take “Tea with Mr Hardy” in the tranquil gardens of Max Gate. Designed by Thomas Hardy himself in 1888, this house still exudes a certain Victorian charm all of its own, somewhat austere perhaps but nevertheless fascinating in a mysterious kind of way. I arrived to watch the performance, part of the tenth anniversary celebrations of the famed New Hardy Players, eager to see this historic building brought to life by this talented band of thespians. How proud must the great man be to behold such events holding court in a place he gave birth to himself, a place he hoped would very much reflect his position as a writer of note, a home to bring acceptance into polite society, a home to show he was justifiably a part of the more opulent middle classes of the town. And what a delightful hour I spent sitting enjoying the sunshine and soaking up all that unravelled before me. Tea was served in true Victorian fashion. Cucumber sandwiches, jam sandwiches, cakes and cups of tea taken before the main event was a lovely touch, a fitting introduction to the arrival of Mrs Hardy – Florence, of course – and her eminent guest Sir Frederick Treves, Sergeant-Surgeon to His Majesty and author of Highways and Byways of Dorset. Hardy himself arrived suitably late and somewhat flustered, before conversation flowed as warmly as the tea itself. And then the moment I had been waiting for, the icing on the cake, the delicious filling in the dainty sandwiches – scenes from the Mayor of Casterbridge courtesy of the New Hardy Players, or in keeping with the times purely the Hardy Players! No matter how many times you see the courtroom played out before your eyes, the laughter just comes and comes. Sue Worth was born to play the hapless but strong-willed vagrant woman from the streets, and her comical timing with police officer Brian Caddy would befit any stage in any theatre in the land – or so I think. And this brilliantly offset the more serious matter of John Trenchard selling his wife to the highest bidder whilst under the influence of the furmity tent! Priceless acting from stalwarts such as Chris Pullen and Alistair Chisholm ….. and even Frederick Treves himself partook of the festivities, standing in and very ably playing a magistrate. What a way to spend a lazy afternoon, assembled under a marquee or dotted across the lawn on sun-drenched chairs and blankets. Touches of the genius that is Tim Laycock echoed throughout the performance, bestowing his own personal interpretation of the renowned Mr. Treves. I loved everything about this, from the setting to the very pleasant company, and there’s more to come, oh much, much more, so take yourselves off to Max Gate and see what all the fuss is about. There are still three more opportunities to take tea with Mr Hardy and some other guests – see the details on our Tea with Mr Hardy page. 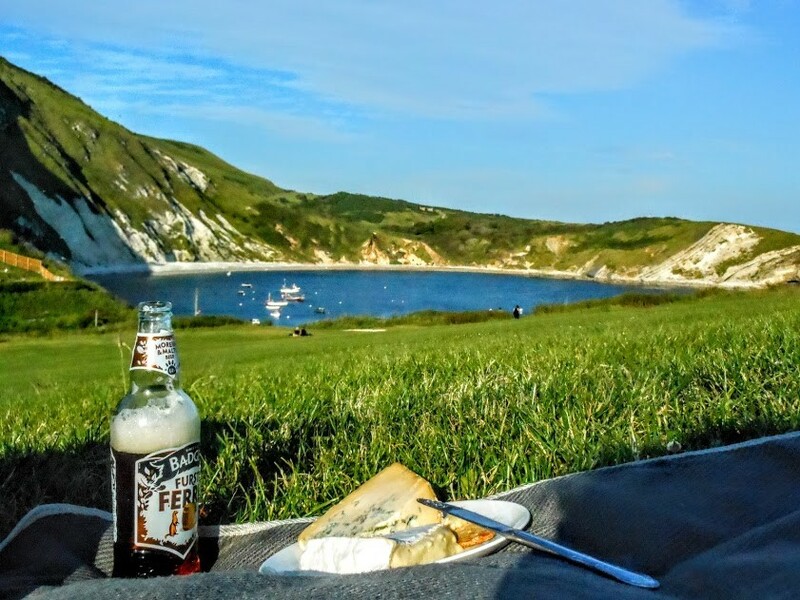 You can’t say you didn’t know, so what are you waiting for ……..
Excerpt from ‘At Lulworth Cove a Century Back‘ by Thomas Hardy. 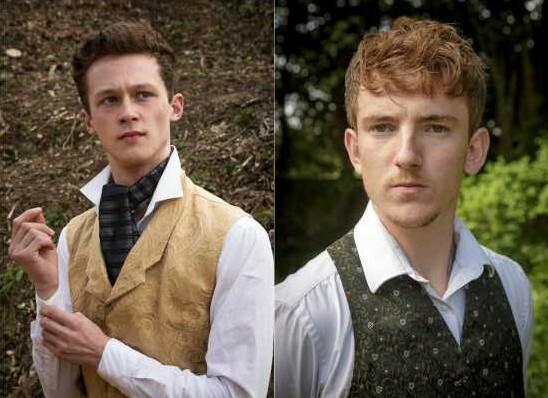 At Lulworth Cove next week Thomas Hardy’s Dorset will be brought to life in open-air theatre by the New Hardy Players, with performances of their new adaptation of Hardy’s ‘The Return Of The Native’ on Thursday 16th and Friday 17th July at 7.30pm, picnics from 6.30pm. Further details and how to get tickets: here. He “came to a small basin of sea enclosed by the cliffs […] He undressed and plunged in. Inside the cove the water was uninteresting to a swimmer, being smooth as a pond, and to get a little of the ocean swell, Troy presently swam between the two projecting spurs of rock which formed the pillars of Hercules to this miniature Mediterranean“.